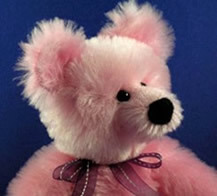 In the quaint little town of Youngsville, just north of Raleigh, North Carolina, Margaret Jackson of Pinney Bears creates her bears, producing about forty enchanting creations a year. 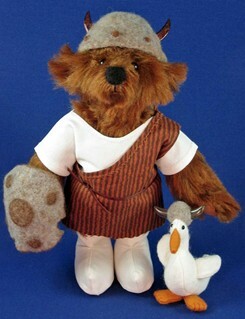 From an old pattern she purchased years ago, Margaret started on her journey into the land of bear-making. But instead of doing the zipper front called for in the original pattern, she opted to make him her own way. "Though he didn't turn out as cute as the pattern, I loved him anyway," she recalled. "He now resides in our Bear Room." 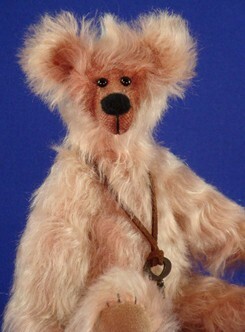 Inspired to create more, she found a pattern for a jointed bear and became hooked on bear making. With husband Bill by her side, aiding her with the tightening of bear joints and attending some of her shows, she spends her off time traveling, visiting with her kids, grand kids and friends. Margaret had no idea when she was working as an Administrative Manager in Technical placement firms, that her life would lead her to bear-making. But bears had been an important part of her past and now her future. 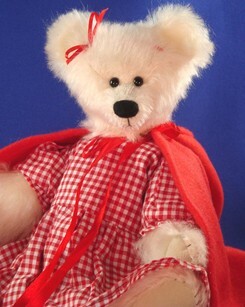 In her youth, Margaret kept the company of a very special bear she named Pinney. 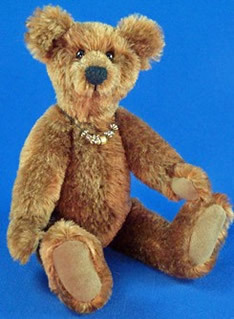 "Pinney Bear was my constant companion. 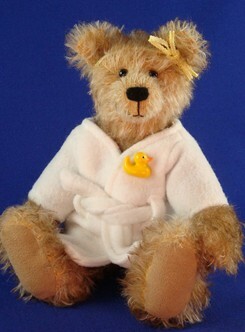 She wore several of my outgrown dresses and even had her own bracelet that she wore on her right paw," said Margaret. 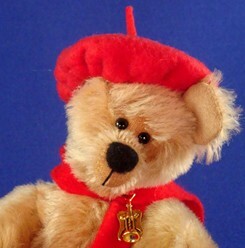 Pinney went everywhere with Margaret from show and tell at school, family trips to Maine and even a trip to visit relatives in France. 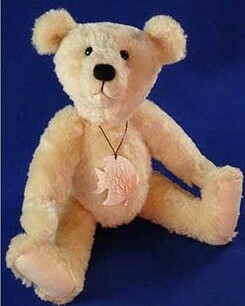 She now honors Pinney's memory with her company name of Pinney Bears. Creativity flows from Margaret easily with other projects she works on as well, such as card making, floral arranging, altered books and needle felting. "I love to read and take pictures," she said, having won some local awards for her photography. She is also a "Stampin Up" demonstrator; teaching classes in card making and scrap booking all with the use of rubber stamps. But bear making has her heart. 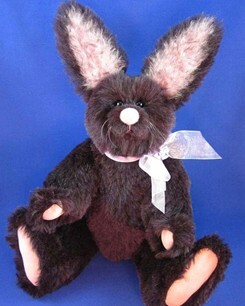 Not only does she create her sweet faced bears with close-set eyes and needle felted noses, she remains an avid teddy bear collector (although she does add some rabbits and mice in her collection). "We actually have a room in our house that has come to be known as “The Bear Room," Margaret confessed. When our oldest granddaughter visits she refuses to sleep in that room – saying she couldn’t sleep in there with all the eyes staring at her! Margaret adding, "I am always getting into trouble with my husband when I purchase another artist’s creation." "He feels since I make bears that I should be able to create bears like theirs." Sometimes husbands just don't understand. 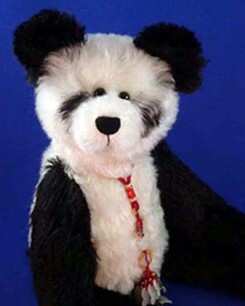 Margaret reads lots of books on bear-making and has taken some hands-on and online courses to hone her talents. She started her business in 2003 and has already won honors in several competitions. "At a particular Christmas/Holiday show, collectors had the opportunity to vote for the exhibitor with the most creative table display and festive costume," she said, "My husband and I dressed up as Angels with the long white gowns, wings and halos. My husband added a little black bow tie to his attire." Continuing she recalled, "As the collectors walked by our booth they giggled. We heard comments such as, “Any man who would dress up like that for his wife deserves our vote” and “How much did you have to pay him?” When the contest was over, we agreed we had a lot of fun and winning First Place was exciting!" 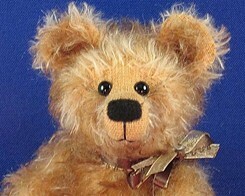 Margaret continues to do Teddy Bear, Doll and Teddy, and a few Craft shows along with selling bears on her web site. She constantly promotes the teddy bear industry by public speaking, and often a presentation about teddy bear making while at an art festival. "I love to participate in Teddy bear shows! There is nothing better than meeting the collectors, watching their faces and hearing their stories as they choose a new friend to take home," she said. So her bears gladly greet the young-at- heart, by putting a smile on their face, a twinkle in their eyes and love in the heart that only a bear hug can bring.